I was born in Kaohsiung, Taiwan, in 1973. Like many people living in a condensed city area, my family lived in a high-rise of four floors. My home was a third-floor apartment with three rooms. It was big enough for the five of us: my parents, my grandmother, my older sister, and me — and three dogs. I loved dogs — and still do! I would bring stray dogs home. My parents would not allow me to keep them, but then they'd give in after seeing how much my sister and I loved the animals. My best friends were those stray dogs. I took the money my mother gave me for school snacks, and I'd go to a bakery and buy a loaf of bread. After school, as I got close to home, I would whistle. (I am a very good whistler, and I find it interesting that even at that age, I used sound to connect with other parts of the world.) Fifteen dogs would come out, and I would feed them. I went to a very competitive, academic middle school, where we attended classes from 7 a.m. till 7 p.m. After homework, home chores, and eating, there wasn't a lot of spare time. But my life was a very normal one for an academic kid in Taiwan. If my mother had had the opportunity for any formal music training early on, she would have become an opera singer. She has a wonderful voice and a sense of drama — she's a natural diva! Instead, she became an educator and taught Chinese literature. My father was a national athlete in his youth, and he trained my sister and me to be athletes — without us realizing it. I thought every kid grew up running laps around the park! My father was a university professor who taught athletics. My parents grew up in the first generation after Japanese occupation of Taiwan had ended, so they were very fortunate to get a college education and became educators, which was viewed very highly when we were growing up. Because my parents both loved music and never had the chance to pursue it, that's how my sister and I began playing musical instruments at a young age. Growing up, I was shy and more of an introvert, and I began to see music as a way of connecting and communicating with others. I played piano and violin. But the first time I played in our school orchestra at age 10 and saw the conductor connecting with everyone in the room — I knew that's what I wanted to do. When he moved his arms, he helped create the biggest sound! I wanted to make that big sound, too. I went home so excited! I told my parents, "I want to be a conductor!" I didn't really know what all a conductor had to do other than wave his arms. My parents frowned and looked worried. They said, "We don't know where to find a teacher for that," and they were absolutely right. In that generation, conducting wasn't something you could be taught or could major in at college in Taiwan. Now? Yes, you can get a degree in conducting. But not then, not in Taiwan. I had to be one stubborn girl who wouldn't take "no" for an answer. I realized I could only learn conducting through observation, so I'd memorize my violin part, and at rehearsal, I just kept my eyes on the conductor. Meanwhile, my parents thought my life's pursuit would be as a professional musician. My parents wanted me to study violin in Taipei, where many famous teachers taught. I auditioned and was accepted, so everything seemed set … except my parents decided they couldn't leave their 12-year-old baby girl in a foreign city, 5 hours away from home. So they made a painful decision that ended up being a blessing to me. They took me back home, but by that time, it was too late to audition for the middle-school music class in Kaohsiung. So they gave up their dreams for me to pursue music, and they enrolled me in academic middle school. This was a blessing because up until that point, I was pursuing music only to please my parents. Playing the violin wasn't what I wanted to do — it didn't make enough sound. I wanted to be a conductor, but again, there were no classes that could teach me that. In academic middle school, I was assigned to be an assistant in a chorus class. I was given a lot of opportunities by a very smart and supportive teacher, who allowed me to conduct the chorus! Other teachers heard about my reputation of training the chorus, and they invited me to work with their choruses. At that point, I was living my dream. I never thought I could have a career conducting, but this was as close as I thought I could get. In high school, we had to choose what our college major would be. I thought I was going to pursue earth science — geology, astronomy — for my career. Conducting, I decided, would just have to be a hobby, a passion. There was no other choice. When I was 16, the Youth Philharmonic Orchestra from the New England Conservatory of Boston came to my hometown, the first stop in its Asian tour. I went to the concert with my accompanist, who could speak English. She went backstage and asked the conductor, Benjamin Zander, if he had time to listen to me play. I arrived at his hotel at 9 o'clock in the morning. The only place quiet enough for me to play for him was a closed bar in the basement. There wasn't a piano around. I played my violin concerto for him in the stinky bar that still smelled of old beer. The conductor said he'd rarely seen an Asian musician who played so much from the heart. Because music was my way of expressing my deeper self, I was playing music for joy and for love, and he saw that passion in me. He did an incredible thing: He offered me a music scholarship to the New England Conservatory on the spot. I knew that — aha! — I had a ticket to fulfill my dream of conducting, because America offered conducting classes. I tricked my parents into giving me a ticket to go to America by telling them I would become a concert violinist. Instead, I took every conducting class I could — in addition to mastering my violin studies. I became the first student to graduate from the conservatory with simultaneous master's degrees — one in violin and one in conducting. Then, I couldn't find a job. I needed a way to legally stay in America because I knew America was the place for me to fulfill my dream. I either needed to be employed or in school. I became a doctoral candidate in 2002 and finished my doctorate of musical arts in conducting from the University of Michigan in 2007. Since that time, I have conducted and guest-conducted symphonies all over the world, beginning with the Portland Youth Philharmonic in 2002, followed by the Atlanta Symphony, then the Baltimore Symphony Orchestra, and now, to my most recent appointments in 2010 as music director of the Memphis Symphony Orchestra and in 2011 as music director for Chicago Sinfonietta. I never thought I would go this far professionally, so I am far beyond what I thought I could do. I'm taking it one step at a time and love the gift I've been given. I am more than happy where I am in terms of my career. Memphis will always be very special for me because it's my first professional appointment. My musical journey is my life's journey. I'm living my dream. That's what I do every day. I knew I wanted to be a music conductor … when I was 10 years old and played in the school orchestra. I saw music and the art of conducting as a form of communication, as a way to connect with as many people as possible. The dream to become a conductor was simply a desire to be part of something much greater than myself. My first musical instruments … were piano and violin. My parents wanted my sister to play violin, and they wanted someone to accompany her, so I learned piano. In my parents' mind, they could have a concert in their home every day! But my sister didn't feel comfortable with the violin and how you have to hold it under your chin while one hand is doing a completely different motion from the other. One day, her violin teacher became frustrated and said, "Maybe the younger sister could try it." I took it up, and it wasn't a struggle for me. So I ended up entertaining my parents on both violin and piano. The musical instruments I play today … I always consider myself a violinist first and an amateur pianist second. I taught myself trumpet, trombone, and percussion. But if you put any instrument in my hands, I'll figure it out within a couple of minutes — at least enough to make sound come out of it! Conductors are … born, not taught. When I was young, I thought I was the weirdo, walking the streets, waving my hands around while I sang a tune. Conducting came so naturally — the gestures were automatic. And later on, when I was able to get into a conducting class, I realized that I'm not the only weirdo in the world. There are other people like me! Symphony vs. orchestra … Technically, a symphony is a musical composition, usually in multiple movements, composed for an ensemble. But the word is also used in place of "orchestra." An orchestra is a group of instrumentalists that usually combines strings, woodwinds, brass, and percussion to play music. My baton … is made from fiberglass and has a cork tip. A baton is an extension of the arm. When you have a lot of people needing a focal point to play together, the baton gives that focus very well. I no longer use different batons for different performances. I used to think that collecting batons was fascinating, but the more I conducted, the more I realized that excellence was not about the baton; the music-making comes from within. If I'm conducting a piece that calls for an intimate session, I may not use a baton at all. A hand can express so much more than a baton. But baton or no baton, it is the clear musical intention expressed through body language and presence that matters most. Before each performance, I … The day of the performance, I try to be quiet, because that's when I can feel the music's presence in me even stronger. I view myself as a servant to the composer, and I need to put myself in touch with that spiritual world of the composer. I may take a walk and conduct the music in my head, or I may quietly study the score. Warm-up for me is doing the opposite of what I'm about to do. I've got to quietly feel that music inside me so that during the performance, I can let the music explode. One especially memorable concert … It was my Concertgebouw debut in Amsterdam. Concertgebouw is like Carnegie Hall in America. 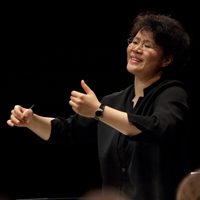 I was only the third woman conductor on the podium in its history, and it was a sold-out crowd — everyone wanted to see a rarity, a woman conductor. My debut performance was a success, but afterward, I accidentally lost my baton bag. The next day, for my second performance, I showed up at the famous dressing room where a lot of famous conductors and composers have been, prepared to conduct with my bare hands. Before the performance, there was a knock on the door, and the principal clarinetist came in. He held a baton very similar to the one I had forgotten. He said, "On behalf of the Netherlands Philharmonic Orchestra, we would like to give this baton to you as a gift so that you will remember your time guest-conducting at Concertgebouw." My least favorite key to play in … is anything that goes beyond six sharps or six flats. It's a conductor's nightmare! Players forget that almost every note in the score has an accidental attached to it. And that's not to say that I don't like compositions that have seven sharps or flats, but it's a challenge to rehearse. A conductor's clothes … Women conductors' clothing can be a big challenge. We don't want to look like men, but at the same time, what will we look good in with our backs facing the audience? My style is pretty streamlined: simple and appropriate. But my goal is that at the end of the concert, the audience will remember my music-making so much more than what I was wearing. My conducting style … is unique and can be quite dramatic. But everything I do on the podium is not for show, not for the audience. I do everything needed to represent the music and to inspire the musicians to create sounds in certain ways for the best musical results. I'm helping each musician connect with the piece being performed. A good musician vs. a great musician … You need the technical side, of course, but a great musician has an extra layer of magic-making that knows how to translate something like sorrow or joy into sound. To touch someone from what you're creating in such a powerful way that the listener ends up with tears in their eyes — that's magic. Most people don't know that … a lot of what conductors do is invisible to the public — even to the musicians. We study scores, which are pieces of paper with music-related notations on them. Those notations are how the composer communicates how he wants the sound produced. It's our job to interpret those notations. Depending on the period, some composers are more vague or more detailed than others. The score is a blueprint that tells us how to put together a piece of someone else's music creation. Often times, we're dealing with 12 to 15 instrument lines, each playing something different, yet together. We have to see all of it at once. We have to have a sense of what that composer is trying to build — every note, every tempo, every rhythm — and it's built during the time we share with our audience. My top three favorite composers … That's really hard. I would say Beethoven, Tchaikovsky, and Antonin Dvorak. The personality of each orchestra section … is unique. I grew up as a violin player, so my comfort zone was always the string section. There's a lot of camaraderie in that section. String players are generally easygoing, hold-it-together players. Bassists and cellists are also very laid back, perhaps because their register is down low. The woodwinds are a little quieter compared to the rowdy brass. Brass players project big sound and have big, shiny instruments. The percussionists are versatile, grounded people because most of the time, they have to carry the whole kitchen sink around with them! Most of us in the orchestra play one instrument very well; percussionists have to play many — different kinds of drums, cymbals, bells, tambourines, special-effect instruments — so it's built-in that they have to be flexible people. I love every part of the orchestra's personalities. When a performance goes awry … For me, it's typically when we have a soloist. I have great admiration for soloists because they have to play or sing from memory, and for that very reason, anything can happen at any time. When a soloist skips two measures, you can adjust without too much notice. But when they skip a whole section, you can't possibly correct it without stopping the performance. One time a soloist skipped a whole section, and the orchestra immediately noticed that something was wrong. One of the players was set to come in in the next section — the section that the soloist had skipped to — and we looked at each other. I cued her, and she took the whole orchestra with her. Everyone jumped to the next section together. I thought, "Hallelujah! We averted a disaster!" because the worst thing to happen is having to stop the piece. There's no such thing as … ugly music. My favorite part of what I do … When I conduct an orchestra, I get to make sound that's much bigger than what I can personally make on my own. My name … is pronounced May-Ann. "Mei" and "Ann" are two Chinese characters. Mei means beauty and Ann means tranquility. My parents did not know my conducting style when I was born! When I travel … I take the gospel of Memphis — what is wonderful about Memphis — to the rest of the world. For people to know about the Memphis Symphony Orchestra, that has been one of the most important things in terms of attracting guest artists to Memphis, of getting new musicians to come audition. And it works both ways in terms of its important that now the industry is keeping an eye on what's happening in Memphis. The number of musicians in an orchestra … It ranges from 60 to 100 and beyond, and it depends on which piece we're playing. For example, a Mozart symphony doesn't take that many players because he doesn't include full winds and brass. But a Mahler symphony would require 100 musicians. I love Memphis for … my new Southern accent and being able to say to audiences all over the world, "Thank y'all for having me." When I told my parents about the MSO position … I called them in Taiwan and tried to say "Memphis" in the Chinese translation. My parents know the bigger U.S. cities, but they had trouble picturing Memphis. I finally said, "It's the hometown of Elvis and Graceland!" They immediately knew where it was. In my first year with MSO … We had a cancellation of a conductor for my second season. What was so amazing was that we took the opportunity to create an international conducting competition. We turned the city into a wonderful hosting community for this competition. The community felt very involved with what the symphony was doing, and we brought three young conductors to Memphis for whom we have made an impact on their professional careers. They all have professional positions now because we helped them along. When I won the Malko Competition for young directors … I was 32 years old and was the first woman to win the competition in its 40-year history. Until then, my parents did not believe I could survive doing what I love: conducting. They did not understand why I felt I needed to put myself through such a difficult journey, but I can tell you, I would not exchange it for anything else. On average, I'm on the road … probably close to half of the year. It's a very nomadic lifestyle, in a way. One of the things I miss tremendously is that because of how much I travel, I'm not able to own animals. But I do call myself a proud Memphian and Chicagoan. I spend about 20 weeks here, 10 weeks in Chicago, and I guest-conduct the rest of the year. It's not for everyone. All of my stuff is not in one place, and I do live out of suitcases half of the year. My least favorite music to listen to … I believe that <<everything>> has a place in our society, and it is my job to at least be open to it. I like to push the envelope, like when Memphis Orchestra did an Opus One collaboration with Al Kapone. Really heavy metal might require me to wear earplugs to listen to it, but there's a place for that kind of music, too. Some music takes a little time to digest. So if I find myself thinking, "I don't like this music," it's because I don't "get it" yet. My job is to "get it" so I can appreciate it. My sister … is 4 years older than me. Her name is Mei-Ling, which means she's very agile and can juggle many things — and that is absolutely her! She never really liked playing musical instruments. She is a singer, like our mother, and is a very talented visual artist who has won many awards for her Chinese paintings. Most people don't realize that I … did not know much English when I moved to the States as a teenager. I had to work hard to begin mastering it. My American parents were Mark Churchill and Marylou Speaker Churchill. Mark is the dean emeritus of preparatory and continuing education at the New England Conservatory, and he was also in that hotel basement with conductor Benjamin Zander when I performed my impromptu audition that brought me to America. Marylou became my first violin teacher in America. During her lifetime, she and Mark hosted 87 international students. My final 2 cents ... I strongly believe there is a purpose for our gifts. Every one of us has a different gift, and we should see how far our gift is supposed to take us. Sometimes you have to just have faith and jump off the cliff, knowing that if you follow your heart, you will figure out a way to fly.